den August 25, 2016, 9:04 p.m.
A common refrain in this election has been that it represents an almost impossible choice between two historically unpopular candidates. Ethicists, opinion writers, and then third-party candidates have put it in even starker terms: in casting a ballot for Clinton or Trump voters are forced to choose the “lesser of two evils”. Except, that’s not quite how voters see it. Among Trump’s voters a striking 83% would use the word “evil” to describe Clinton. Clinton voters aren’t much less willing to mince their words, with 66% describing Trump as “evil”. However, these points of view rarely overlap. 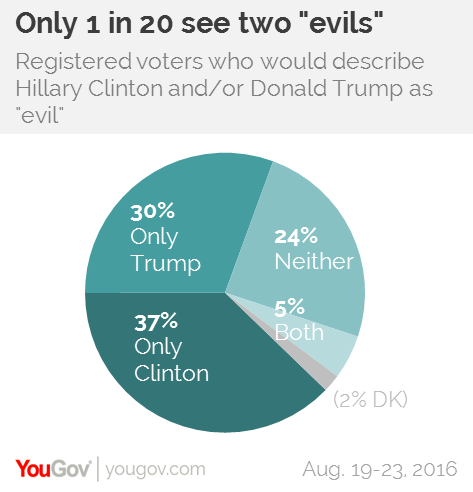 In fact, 37% of registered voters describe only Clinton as evil, and 30% describe only Trump as evil, and 24% describe neither candidate this way, but only 5% describe both candidates this way. Groups that are more likely to describe both candidates as evil are voters aged 18-34 (12%) and those who support third parties or are undecided (19%). Despite how much attention the “lesser of two evils” framing gets, voters tend to be pretty consistent about the candidates they do support – or oppose. Digging through the same poll reveals concentric layers of likes and dislikes for candidates. 96% of Trump supporters have an unfavorable opinion of Clinton, of which 91% is “very” unfavorable. 94% say Clinton is “corrupt”, 92% say she is “dangerous” and 62% say she is “crazy”. For Clinton supporters, the numbers are again not far off: 92% say Trump is dangerous, 85% say he’s crazy and 78% say he’s corrupt. Conversely, 82% of Clinton supporters say she's "compassionate" and 65% of Trump supporers say the same for their candidate. And in most cases, supporters refuse to use negative words to describe their preferred candidate. That’s not to say all voters aren’t making a tough decision in some way. Cases where supporters are more likely to say something negative reveal the candidates biggest vulnerabilities: for Clinton, it’s the 16% of supporters who say she is “corrupt”. For Trump, it’s the 15% of Trump voters who say he is “dangerous” – and the 20% who say he is “crazy”.